The shootout goes down January 26th inside United Center in Chicago, Illinois. The championship affair headlines the freebie fight card. 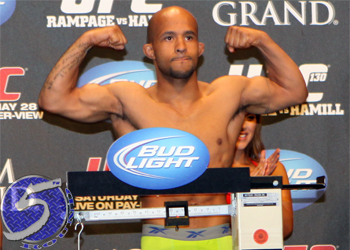 Johnson became the Octagon’s first 125-pound king by beating Joseph Benavidez in the four-man flyweight tournament. “Mighty Mouse’s” lone loss since 2010 came in a bantamweight title bout against reigning UFC champ Dominick Cruz in October 2011. Dodson earned his shot at the throne with last month’s TKO victory over Jussier da Silva. He’ll be riding a five-fight winning streak into the biggest scrap of his life. FOX will broadcast the card’s main bouts live beginning at 8PM ET/5PM PT.